Whatever has been going on since I started down this creative procedure it has been going about its business hidden from conscious view. I haven’t been immediately aware of much more than “something” is happening, and so I’ve waited for the next step to appear and indicate whether I might join in with a conscious intent of any kind. “Still waters run deep,” said my friend Kimaroo recently. Oh yeah, that’s right! I forget these things, whether its concerning people or matters of psychic complexity. Then, an eruption. Or rather, an image of molten liquid in motion as if it were magma spilling out of the earth. And yet, transition into a process more amenable to human interaction: A foundry. I live in the area of the country that is known as “the foundry” after all. Funny that something I take as a negative about the place I live should suddenly take on a very vital and important force of life! I watch the opening sequence of the 1976 adventure yarn At The Earth’s Core and then it strikes me that this is exactly what is happening. Strange primordial powers deftly transformed by a sleight of hand into a process familiar to human endeavor. Though still fantastical given that a fantasy craft is being built out of this process, incredibly. When I started I was composing a crystal matrices to bring together the elements and intentions I would need. Next I revealed the components and blueprints I would use (I’ve found others since then). I’ve been working on transpersonal narratives necessary to my journey. Molds that will serve to form the parts I will use to build the finished craft. And now, we are at the foundry. I search for and find a diagram that shows me how it all works on a mundane but necessary external level. The elements are brought together into various furnaces and other mechanisms that turn the elements into the compounds that will make up the parts. Moving from lowest to highest, from the Blues up. 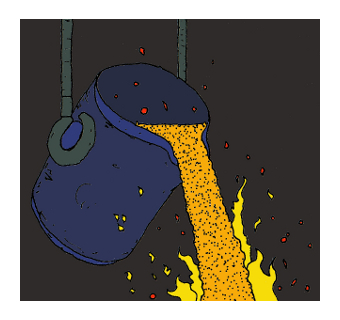 The central image of the molten liquids is where it all comes together—the crucible and cauldron of utmost hazard and intense energy directed towards the formation of psychic parts. Sparks fly, liquid fire falls to the ground in sizzling droplets. I am witness to a process inside myself of great childhood power. The parts, cooled and cleaned then go to a place of manufacture. Industry is a word that has to do with women’s work. It may be directed towards mostly destructive, accumulative ends—yet the hands that strike the anvil and thread the wire are borrowing the true form of crafting: Introspection. Creating substance out of thought and from that substance, goods. I dreamt of a UFO being sighted in a way that was also recognition of a form to be. Input from the dream state, cooperation from the unconscious. I come across a video of The Bamboo Saucer, a film that in a way is about earthlings struggling to understand a UFO and direct its use towards peaceful means. This is, in a sense, a training manual and familiarity exercise to show me that I have been studying up for this since I was young. K and I watch GalaxyQuest, and it dawns on me this is also a relevant experience of understanding. Of knowing that what you imagine is real, while also recognizing that it is absurd and that life is filled with terrible changes into new forms of consciousness from which life emerges, better than before. I’m coming to an understanding of the tremendous forces at work within me, of me choosing to become part of this process and behold a beautiful, mysterious Karavos revealed to me. Her name is coming to me. The Diamond Island is powered by	WordPress 4.9.10 and delivered to you in 0.592 seconds using 28 queries.